All Web addresses mentioned were functional as of 2-24-17. From the Cumberland Gap to the Atlantic Ocean, this is Virginia Water Radio for the week of February 27, 2017. This week, we feature another mystery sound, from an amphibian whose population details remain, in fact, mysterious, even to herpetologists, the scientists who study amphibians and reptiles. Have a listen for about 10 seconds, and see if you can guess what’s making this call. And here’s a hint: to guess this name, combine a Virginia sunrise’s direction, a playing card suit or garden tool, and what’s in your shoe. If you guessed an Eastern Spadefoot, you’re right! This animal—which some references consider a kind of frog, and others a kind of toad—is one of seven spadefoot species in North America, but the only one found east of the Mississippi River. It’s 2-to-3 inches long, brownish with two yellow back stripes, and with vertically-oriented pupils, in contrast to the more horizontal pupils of other frogs and toads. But a spadefoot’s most characteristic features are hard, spade-like projections on the hind feet, with which the animal can burrow into sand or other loose soil in order to avoid dry conditions. In Virginia from early March through spring, Eastern Spadefoots typically emerge in large numbers after heavy rains to breed in seasonal wetlands, flooded fields, or other temporarily wet areas. They’re mostly known in the Coastal Plain, but much remains unknown about this species’ distribution and habits in the Commonwealth. That’s why scientists Jason Gibson, at Patrick Henry Community College in Martinsville, and Travis Anthony, at J. Sargent Reynolds Community College in Richmond, are leading a project in 2017 to learn more about the Eastern Spadefoot in Virginia. Collaborating with the Virginia Herpetological Society and the Virginia Department of Game and Inland Fisheries, they’re inviting other Virginians to participate, too, by watching and listening for this secretive creature, and by submitting information on any encounters. 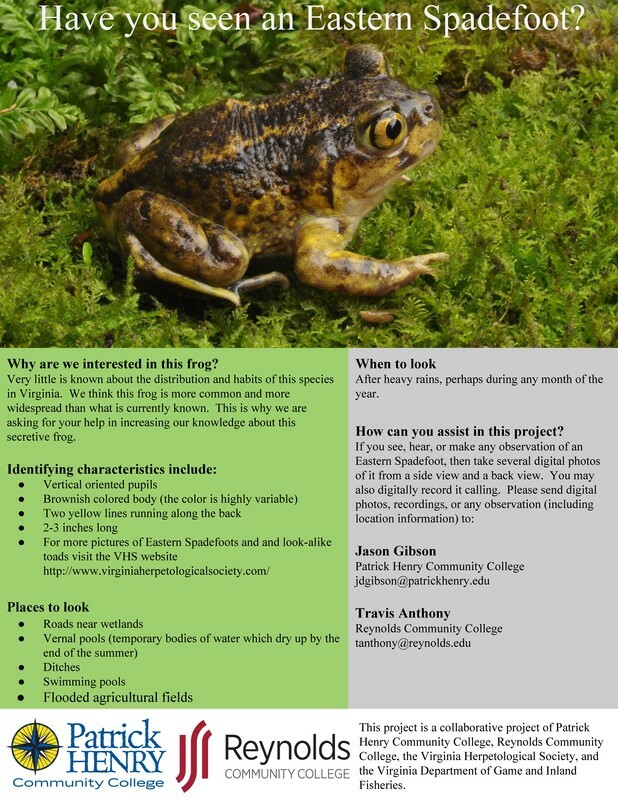 To learn more about the project, or to submit spadefoot observations, e-mail jdgibson@patrickhenry.edu, or tanthony@reynolds.edu. Thanks to the Virginia Department of Game and Inland Fisheries and to Lang Elliott’s NatureSoundStudio for permission to use the Eastern Spadefoot sounds. The Eastern Spadefoot sounds were from “The Calls of Virginia Frogs and Toads” CD copyright 2008 by the Virginia Department of Game and Inland Fisheries (VDGIF) and Lang Elliott/NatureSoundStudio, used with permission. The calls CD is part of the VDGIF’s A Guide to the Frogs and Toads of Virginia. For more information, visit https://www.shopdgif.com/product.cfm?uid=1928838&context=&showInactive=N, or contact VDGIF at 4010 West Broad Street, Richmond, VA 23230; phone: (804) 367-1000 (VTDD); e-mail: dgifweb@dgif.virginia.gov. Lang Elliott’s work is available online at the “Music of Nature” Web site, http://www.musicofnature.org/. Click here if you’d like to hear the full version (1 min./11 sec.) of the “Cripple Creek” arrangement/performance by Stewart Scales that opens and closes this episode. More information about Mr. Scales and the group New Standard, with which Mr. Scales plays, is available online at http://newstandardbluegrass.com. 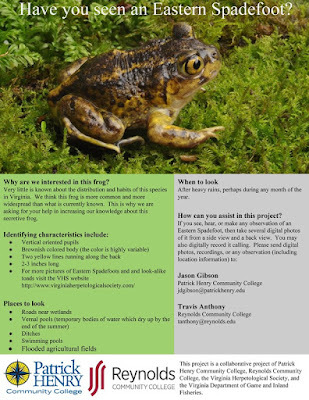 Poster from Jason Gibson (Patrick Henry Community College, Martinsville, Va.) and Travis Anthony (J. Sargent Reynolds Community College, Richmond, Va.) promoting their project to learn more about the Eastern Spadefoot in Virginia. Accessed at the Virginia Master Naturalists Web site, http://www.virginiamasternaturalist.org/home/in-search-of-spadefoots, on 2/27/17. From the Virginia Department of Game and Inland Fisheries (VDGIF), “Eastern spadefoot (Scaphiopus holbrookii),” online at https://www.dgif.virginia.gov/wildlife/information/eastern-spadefoot/. Encyclopedia.com, “Spadefoot Toads,” online at http://www.encyclopedia.com/science/encyclopedias-almanacs-transcripts-and-maps/spadefoot-toads-pelobatidae. Jason Gibson, “In Search of Spadefoots,” Virginia Master Naturalists Blog, 1/24/17, online at http://www.virginiamasternaturalist.org/home/in-search-of-spadefoots. J. Sargent Reynolds Community College, online at http://www.jsr.vccs.edu/. John D. Kleopfer and Chris S. Hobson, A Guide to the Frogs and Toads of Virginia, Special Publication Number 3, Virginia Department of Game and Inland Fisheries, Richmond, 2011. Bernard S. Martof et al., Amphibians and Reptiles of the Carolinas and Virginia, University of North Carolina Press, Chapel Hill, 1980, pages 104-5. New Hampshire Public Television, “Scaphiopodidae—American Spadefoot Toads,” online at http://www.nhptv.org/wild/scaphiopodidae.asp. Patrick Henry Community College, online at http://www.ph.vccs.edu/. Virginia Department of Game and Inland Fisheries, “Eastern spadefoot (Scaphiopus holbrookii),” online at https://www.dgif.virginia.gov/wildlife/information/eastern-spadefoot/. Virginia Herpetological Society, “Eastern Spadefoot (Scaphiopus holbrookii),” online at http://www.virginiaherpetologicalsociety.com/amphibians/frogsandtoads/eastern-spadefoot/eastern_spadefoot.php; and “New 2017 Eastern Spadefoot Project,” online (as PDF) at http://www.virginiaherpetologicalsociety.com/2017spadefoot/Eastern%20Spadefoot%20Poster.pdf. Virginia Wildlife Mapping Web site, online at http://www.inaturalist.org/projects/virginia-wildlife-mapping. This site provides a location for citizens to post their observations about wildlife, including amphibians. The site is a collaboration of the Virginia Department of Game and Inland Fisheries, the Virginia Master Naturalist Program, and iNaturalist.org. All Water Radio episodes are listed by category at the Index link above (http://www.virginiawaterradio.org/p/index.html). Please see specifically the “Amphibians” subject category. For another episode on herpetological (amphibians and reptiles) research, please see Episode 69, 6/20/11, “Herp Blitz,” a Virginia Herpetological Society large-scale survey in 2011. The Society does various surveys each year. SOLs for gathering and analyzing data for appropriate ages; possibly 1.1, 2.1, 3.1, 4.1, 5.1, and 6.1. 5.5 - cell structures and functions, organism classification, and organism traits.